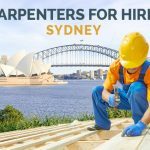 Calling All Carpenters: Carpenters Jobs in Sydney Available Now! 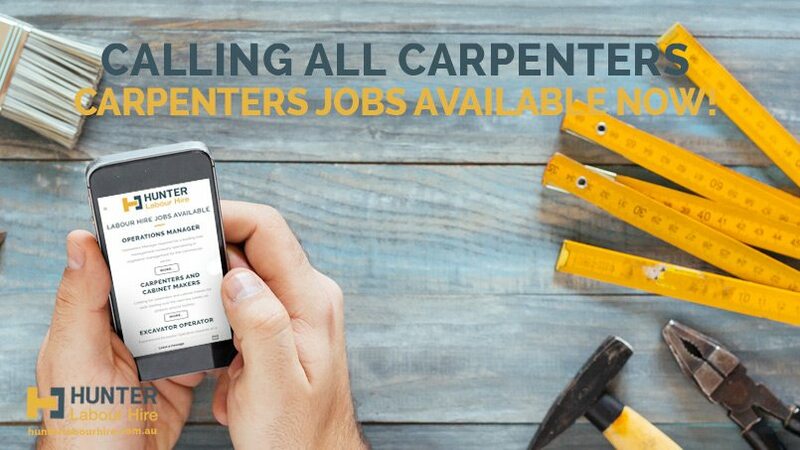 11 Apr Calling All Carpenters: Carpenters Jobs Available Now! 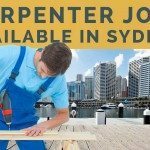 Carpenters Jobs Available in Sydney Now! At Hunter Labour Hire we are continuously looking out for the best carpenters to join our team. With ongoing work, competitive rates and great working conditions we can offer qualified carpenters with the right experience great opportunities throughout the Sydney Metropolitan area. We already have an experienced crew that are constantly kept busy and now require hard working, motivated individuals to join our team and continue to help us grow. 1. Qualified carpenters for ongoing projects in Sydney’s Inner West working on renovations, extensions and knockdown rebuilds. Must have experience in all aspects of carpentry 1st and 2nd works will include framing, doors, windows, staircases, decking, flooring, skirting. You will be working in a small team on architectural designed homes and therefore must be able to read drawings and carry out work to the plan specification. You must be able to work well within the team to completes tasks but also be competent to carry out work unsupervised on your own. 2. Qualified carpenter with experience installing sash windows required for work throughout Sydney. Majority of work will be fitting or repairing sash windows, but applicants must be experienced in all aspects of carpentry and will be required for door framing, doors and staircases. Applicants will be required to travel to various projects across Sydney therefore applicants with a car or ute are preferred. Online registration – All applicants must complete our online registration form and send through an up to date resume. Face-To-Face Interview – Once we have conducted an initial phone interview we will then invite candidates into our office for a face-to-face interview. This gives us a chance to discuss positions available and find a suitable placement. Document Check – We complete a document check to ensure all qualifications and construction tickets & licences are in date. We also check references and visa status at this stage. The type of carpenters we are looking to add to our books should be able to tick all of the boxes below! Qualified carpenter (Australian qualification or international equivalent). White card and all PPE. Tools and transport preferred but not essential. We like to think we offer our labourers and tradies some of the best pay in Sydney but also try to provide the best experience for our tradies as happy tradies make for happy clients and safe and successful projects! If you join the HLH team this is what you’ll get! Apply For Carpentry Work Today! 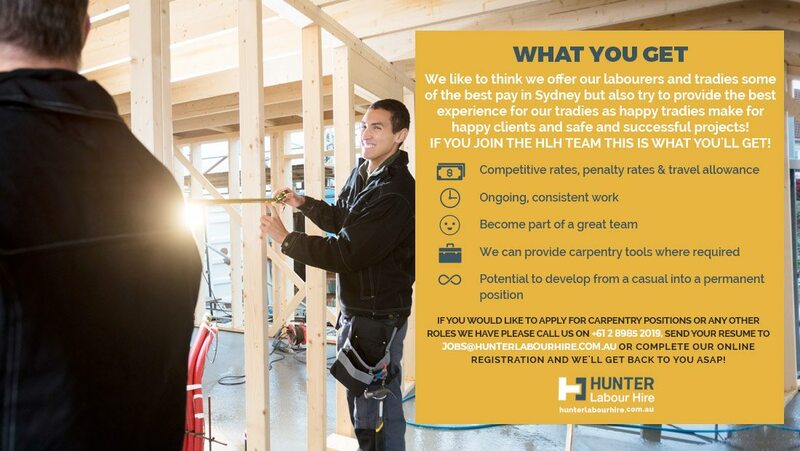 If you would like to apply for the above carpentry positions or any other roles we have please call us on 02 8985 2019, send your resume to jobs@hunterlabourhire.com.au or complete our online registration and we’ll get back to you asap!